The Abbey is one of Sport England’s National Sports Centres and is home to a number of National Governing Bodies of Sport. Bisham Abbey provides excellent facilities to Britain’s leading sports men and women, and aims to provide a world class experience where everything we do ensures that our customers are valued and their satisfaction and recommendation to others is paramount. Meetings and conferences are held in stunning and historic meeting rooms throughout the Abbey. As well as including the latest technologies, all meeting rooms at Bisham Abbey include Bisham Abbey note paper and pens, projector and flip chart, ensuring your meetings run smoothly. Bisham Abbey is steeped in rich history and provides the perfect romantic backdrop for your wedding day in Buckinghamshire. Set amongst picturesque grounds on the banks of the River Thames, Bisham Abbey caters for any type of wedding, from small, intimate gatherings to larger marquee weddings in the beautiful gardens of the Abbey. 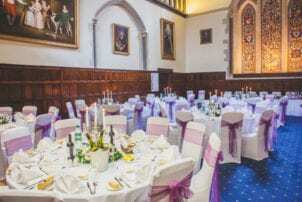 Bisham Abbey is fully licenced for Civil Ceremonies in both The Warwick Room and The Great Hall. Book this venue or let us help you find more perfect Venues in Buckinghamshire for your event.